The first of two bright comets predicted for 2013 will soon be appearing in the evening sky for observers in the Northern Hemisphere. The comet — while not as bright as first predicted — will still be more brilliant than any comet seen in recent years, so here are some tips to spot the celestial wanderer. The Comet Pan-STARRS, known officially as C/2011 L4 (PANSTARRS) will be readily visible with the unaided eye, though binoculars will be a help for spotting it against the twilight sky. Weather permitting, the comet could be as bright as a first-magnitude star on the brightness scale of night sky objects (the lower the number, the brighter the object). After months appearing in the Southern Hemisphere night sky, Comet Pan-STARRS will make its first appearance in the Northern Hemisphere sky on Thursday (March 7). If this advice sounds a little vague, it is because comets are slightly unpredictable, in particular their brightness. Also, observing locations vary widely in their suitability to observe objects close to the sun. Try to find a site with a very low western horizon to improve your chances of catching sight of the comet early. The farther south you live on Earth, the more likely you are to see it early. Any haze in the air will make it harder to see the comet. Comet Pan-STARRS made its closest approach to Earth on Tuesday (March 5), when it passed by at a range of about 102 million miles (164 million kilometers). The only large objects closer to Earth on that date were the moon (at a range of 228,442 miles, or 367,642 km), the planet Mercury (58 million miles, or 93 million km) and the sun (92 million miles or 148 million km). The path of Comet C/2011 L4 (Pan-STARRS) over the next month. The comet will still be low in the western sky on Sunday, and may be lost in the sun's glare. It will fade in brightness over the next few days, but at the same time will be higher in the sky at sunset. SPACE.com will provide up-to-date information on sighting opportunities for the comet. Two comet-watching dates to prepare for now will be next Tuesday and Wednesday (March 12 and 13). On those evenings, the thin crescent moon will be close to the comet in the sky. Depending on the size and direction of the comet's tail, the moon may actually be silhouetted against the tail on March 13. On April 3, Comet Pan-STARRS will pass within a few degrees of the Andromeda Galaxy, making for a great photo opportunity for stargazers with telescopes. The comet and the galaxy will both shine at about 5th-magnitude on that date. We are used to comets being named for their discoverers, but in recent years there have been many comets discovered by teams rather than individuals. When first discovered, comets are assigned unique designations based on the year and month of their discovery. For Comet Pan-STARRS, that designation is C/2011 L4 (PANSTARRS). The year marker is easy to figure out, but the month is a bit complicated, because astronomers use a letter based on the half-month of the discovery. For example: the letter 'A' denotes the first half of January, 'B' is for the second half of January, 'C' for the first half of February, and so on. There is also a name in parentheses indicating the discoverer. In this case, the comet was discovered by a team project named PANSTARRS, short for Panoramic Survey Telescope and Rapid Response System, which actively searches for asteroids and comets using a telescope in Hawaii. The problem with this name is that the PANSTARRS project has so far discovered a number of comets, which makes this only one of quite a few "Comets PANSTARRS" in the sky. Whatever we call it, this comet should be a pretty sight in the early evening in March and it is not the only comet to grace the night sky this year. 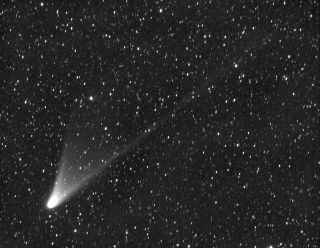 Another southern night sky comet, Comet Lemmon, has wowed some stargazers who have managed to observe it from the Southern Hemisphere and in November, the promising Comet ISON could put on a dazzling display when it passes closest to the sun. This story was update at 8 a.m. ET March 7 to correct the official designation of Comet Pan-STARRS, which is C/2011 L4 (PANSTARRS).